The classic DB25 collection, with its dreamy depiction of the star-studded sky, welcomes a delightful feminine touch in the shape of the dainty DB25 s jewellery model. This creation is distinguished by the many ways in which the light plays across the materials and the complex dial architecture. 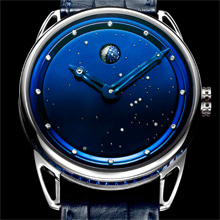 The dark gleam of hand-polished and blued titanium, the sparkling twinkle of the white gold and diamond stars, and the muted glow of the curved blued steel hands… The depth of this star-studded sky is revealed through the alternating curves that are convex on the outside for the chapter ring, and concave in the centre. A spherical moon set with sapphires and diamonds shines at 12 o’clock, providing an exceptionally accurate moon-phase display that will diverge from astronomical reality by just one day in 122 years. This exceptional creation may be made truly unique, such as by personalising the star-studded sky, on request, according to a specific geographical place and date. The rounded case with the signature hollowed lugs of the DB25 collection has been narrowed to 40 mm to ensure a better fit on women’s wrists. Adorned with 61 baguette-cut sapphires, it radiates a resolutely modern feminine charm. 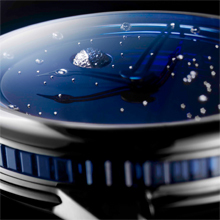 This Haute Joaillerie creation enjoys all the advantages of De Bethune technology, since it is powered by the hand-crafted DB2024 movement, of which the mirror-polished finish, the silicon/platinum annular balance, and the triple pare-chute shock-absorbing system may be admired through the back of the watch. The noble horological traditions perpetuated in the De Bethune workshops in L’Auberson are embodied in this poetic timepiece with its avant-garde mechanism. Self-regulating twin barrel* – The barrels are specifically designed to decrease friction and efficiently transmit a maximum of energy. Silicon/platinum balance wheel* with flat terminal curve – Its exceptional lightness enables this balance wheel to reduce mechanical friction and deliver an ideal inertia/mass ratio. The principle of the flat end curve, placed on the same level as the balance-spring, compensates for off-centering and facilitates its fastening. 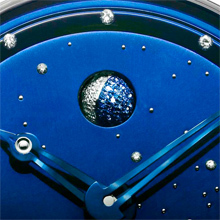 Exclusive three-dimensional moon-phase display* by means of a platinum and steel sphere set with 44 diamonds and 44 blue sapphires, spinning on its own axis with a precision amounting to a mere one-day difference every 122 years.